User was warned for this post and others like it. In the future, add more content to your posts. Not a fan of the pocket rule tbh. I don't feel like it helps or hinders attack types in any way, as attack types can bounce back off the pocket wall as well. Just don't like changing something that has so much to do with luck, but has a very small effect, as stated above. Wonder how the meta game will be with D2 and Deathscyther back in. It's helpful for those who weren't albe to get mG ( like me T-T ) to have a suitable but not overpowering replacement. (Sep. 17, 2017 11:43 PM)ThaKingTai Wrote: Not a fan of the pocket rule tbh. I don't feel like it helps or hinders attack types in any way, as attack types can bounce back off the pocket wall as well. Just don't like changing something that has so much to do with luck, but has a very small effect, as stated above. We welcome your feedback once you've seen it in practice at a couple events! If it turns out to not work well for most areas as it has during our test events, we can certainly revisit it. However, we do think it is worth implementing at this juncture to inject a greater incentive to use attack types in a series that has been plagued with poor KO rates in comparison to other series. 1. An attack type user launches and hits the back wall and bounces back in at the beginning of the battle before any contact is made. This will not count as a KO in these new rules, protecting against this type of occurrence. 2. An attack type Beyblade lands a powerful blow, causing the opposing Beyblade to bounce off the back of the stadium cover exit back wall and back in to the stadium. In the new rules, this will be a KO for the attack type. As a result, we felt that it would be advantageous to implement this rule for the sake of increasing the potency of attack types, if only slightly. Of course, there will inevitably be random situations where what you're describing could happen, but by our estimation and experience thus far the above two situations happen more often. It's less a question of luck and more that the attack type user has a good shot, but has a KO stolen away from them due to what is basically a safety measure necessitated by the Burst mechanism of this particular series (the stadium cover). This is something I first started really noticing with Lost Longinus back when it came out; so often while playing with it the #2 situation above happened, and it felt so ridiculous that the L2 combo ended up losing the battle when in a more traditional stadium without a stadium cover, it would have won. The same thing has started to happen with the powerful lS as well, which is what spurred the discussion about this back to the forefront recently (where Kai-V pointed out that our old rules before we attended to simplify them for the sake of brevity last year with our revamped rulebooks implied that coming back into the play area after leaving it didn't used to be legal, which was not really our intention to begin with). I agree with most of stuff again but tbh I'm not sure on that pocket rule yet, lets see how it affact our tournaments. as we use Burst stadiun for our MFB events (though I got new BB10 for next event), many outcome of battle were caused by bey bouncing back in stadium. Best example would be Snidmist's Reviser Dragoon BD which like whole event after taking big hit was bouncing in and win battle by breaking pattern of attacker. Even my victory with AaryanBITW's Flash was due to my Duo bounced in at last round. As for Dootscooters (lol). I'm happy + excited to see how they deal with current stamina type. Burst Format Rulebook - Gameplay Appendix: Knocked-Out Wrote: A Beyblade is now considered knocked-out when it exits the play area. Beyblades that bounce back in to the stadium after exiting the play area are still considered knocked-out. However, if a Beyblade exits the play area and bounces back in before touching the opposing Beyblade in any fashion, the round may continue. May or Will continue? May implies judges decision? (Sep. 18, 2017 8:13 AM)FIREFIRE CPB Wrote: I agree with most of stuff again but tbh I'm not sure on that pocket rule yet, lets see how it affact our tournaments. as we use Burst stadiun for our MFB events (though I got new BB10 for next event), many outcome of battle were caused by bey bouncing back in stadium. Best example would be Snidmist's Reviser Dragoon BD which like whole event after taking big hit was bouncing in and win battle by breaking pattern of attacker. Even my victory with AaryanBITW's Flash was due to my Duo bounced in at last round. It will have a larger effect on MFB if you're using that stadium for sure. However, I would argue that it will actually help to simulate what would happen in the BB-10 when something was knocked out. In the BB-10, there is no stadium cover, so when you get knocked-out, you're knocked-out. That's what this rule effectively accomplishes. Coating the inside of launchers with lubricant is currently illegal and falls under our "foreign substances" rule in every rulebook. However, this is something we have been meaning to consider and have discussed in the past, so we will try to come to a decision on it for our next update. (Sep. 18, 2017 10:49 AM)OldSchool™ Wrote: May or Will continue? May implies judges decision? Will. I wrote "may" as in "the round may continue as opposed to the other outcome described above where a Beyblade bounces back in after touching the opposing Beyblade" ... but I'll update it to "will" later to be clearer. It is the judges decision whether a Beyblade bounced back in with or without touching the opposing Beyblade based on what they observed, but if they do observe that it bounces back in without touching the opposing Beyblade, the round will continue. Thanks! I like the new rule update. I just hope D and D2 won't become op again. Cool, I can still make my Wombat-themed Speed Launcher lol. I'm glad to see Deathscyther unbanned, that's something that's been long overdue. I am kind of worried about D2 now that Atomic is in the game now though - back when D2 was legal the most popular setups used Defense and Orbit, which were good for Destabilization but lost to L2 Hold. When building a Stamina combo during the D2 era, you had the meaningful choice of using Defense to counter D2, but lose to L2, or Revolve to counter L2, but lose to D2. But now that the best Destabilization Driver is also one of the best options for Precession while also having the raw Stamina to outspin Defense, it seems like D2 Atomic has the potential to beat a few too many things imo, even if it gets destroyed by lS (and possibly gV and sX)? Another semi-related ruling thing that I want to bring up before I forget about it again is the matter of non-contact bursts in Deck Format. Yes, they do exist - you can clearly see in the first round of this battle that Lost Longinus bursts without touching Drain Fafnir at all. Currently, the rules state that any kind of burst is worth 2 points, while non-contact KOs are worth 1, but I think that non-contact bursts should also only be worth 1 point. In most cases, they are both products of a bad launch, so why should someone be penalized more for running into a wall and self-bursting as opposed to running into one of the pockets, or for bursting on the stadium cover on the way down vs missing the stadium entirely? 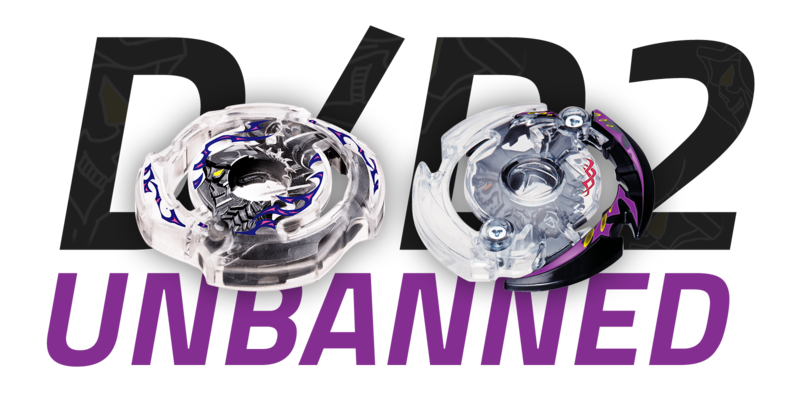 It's great that they unbanned D/D2 layers, because those are a favourite of some Bladers. And what is a tournament good for unless you compete with your favourite Bey. (Sep. 20, 2017 6:48 AM)Wombat Wrote: I'm glad to see Deathscyther unbanned, that's something that's been long overdue. I am kind of worried about D2 now that Atomic is in the game now though - back when D2 was legal the most popular setups used Defense and Orbit, which were good for Destabilization but lost to L2 Hold. When building a Stamina combo during the D2 era, you had the meaningful choice of using Defense to counter D2, but lose to L2, or Revolve to counter L2, but lose to D2. But now that the best Destabilization Driver is also one of the best options for Precession while also having the raw Stamina to outspin Defense, it seems like D2 Atomic has the potential to beat a few too many things imo, even if it gets destroyed by lS (and possibly gV and sX)? D2 definitely gets destroyed by lS, and I imagine sX as well at least. Remember we can always re-ban it if necessary, but I feel like it won't be because the game is so dramatically different now and we have something like lS which completely dominates D2. We had Minoboros before which was fine, but Minoboros wasn't also simultaneously great against almost every other Layer like lS is right now. D2 also loses to gK I'm pretty sure. What it can do is OS and resist bursting against gZ, which I think is important because gZ is one of the most versatile Layers in the game right now and it was sort of hard to counter consistently with anything other than mG before. So while I think Deathscyther is no longer top tier (have to do a bit more testing, but obviously lS destroys it and gK OSes it), I do think D2 will have a place in the metagame for the time being, even if it's small. Thinking about it now I would tend to agree with a 1 point non-contact Burst ruling for Deck Format. What do you think ~Mana~, Kai-V, Angry Face, and cadney? ^I concur with all of this. Likewise, it's a fair ruling, I agree. I guess that if we have contactless exit worth one point, then the Blader's fault in hitting the wall and bursting should count for only one point too. 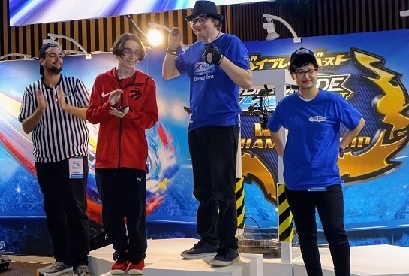 I think that the update will be good and now it's fair.In my point of view,a beyblade cannot change your gameplay in many cases,But a good stratergy and expirience will lead you to a clean victory.But because it's a decision by the staff,I hope something awesome would happen!! I completely disagree. You're taking out all the walls, and even if you do have the ridges it's not the same. This would also make it easy for parts just fly wherever, which would not be fun.